"I have been treated by other chiropractors in the past and the results were always short term. Dr. Katz is the first chiropractor who took the time to really access my issues. He did many diagnostic tests to determine the root of my problems and took the time to treat me comprehensively. Many chiropractors just adjust and send you on your way. Dr. Katz helped me work on my core and posture as well as adjust my spine and neck. The results seem to be lasting and I would recommend him to anyone with chronic neck or back issues." "I have been using chiropractic care since I was in college. (over 30 years) I found Dr. Katz when I moved here from Seattle, WA. I think Dr. Katz is one of the best chiropractic care physicians I have ever used. He is an excellent provider and I have never felt that Dr. Katz is prescribing more treatment than I need. Not only does he do a great job in the office, but he spends time with you teaching you exercises that specifically help with your own personal health". "I have been a patient of Dr. Katz for 15 years or so and have been treated for a variety of back/neck issues . He has always been able to relieve my discomfort in very few visits and sometimes just after a single visit. He often asks question and listens carefully about the symptoms I have before deciding on what treatment is required, I highly recommend him and I have always been satisfied"
"My family and I have been seeing Dr. Katz off and on for over 15 years. In every instance he has provided short term relief from our pain and long term therapeutic care. We highly recommend him." “I just wanted you to know how much my father-in-law and I appreciated you seeing him on your day off, and over the New Year Holiday. He is feeling much better and his drive home was not a problem for him. Thank you for going above and beyond the call of duty. Your patients are lucky to have such a dedicated doctor." "In a word, Dr. Katz is- Fantastic! His attentive listening skills and deep experience enabled Dr. Katz to get to the root of my pain issues quickly. He proactively explained each step of his corrective procedures in terms I could easily understand. His approach was designed to fix me up and get me on my way as soon as possible. Dr. Katz is an absolute pleasure to be with. I would highly recommend Dr. Katz for any chiropractic needs!" "Dr.Katz is one of the best chiropractors that I have been to. He is a friendly, nice man that takes time to go over your concerns. Adjustments are great! Reasonable prices and allows you to come back as you feel the need, not by prompting. No sales pitch here just a really good doctor that is there for you when you need him." "Dr. Katz is one of the most effective chiropractors that I have been to. He is professional--ordered xrays of my spine and hips to determine the actual cause of my pain. Then he adjusted my back and neck and advised me as to lifestyle changes. I feel much better, now, and would highly reccomend Dr. Katz." "I had been seeing another chiropractor for many years with limited success. Dr. Katz solved my problem within two months. Eliminating my pain has made a big difference in my life. Thanks"
"Dr. Katz is the best Chiropractor I have ever been treated by, and I have been seeing chiropractors for 20+ years. I have been going to him for over 10 years now and am very pleased with the results. Whether it is an old injury or a new one he knows how to diagnose and provide the proper treatment. If he needs extra data, he has an x-ray or MRI done to help him determine the correct course of action. My son hurt himself in football and after reviewing the MRI, Dr. Katz was able to diagnose and fix the problem within 3 visits. The best part of being treated by Dr. Katz is he doesn't drag out the treatment; he fixes the problem and gets you on your way! If you have back/foot/ankle/wrist/neck/knee/hip pain and want it to go away, call Dr. Katz; I HIGHLY RECOMMEND HIM." "I have been a patient of Dr Katz for many years. When my bones/muscles hurt, I go see him. He listens, cares and goes out of his way to help you. He does not take chances and will have you get an XRay if he feels he needs it. I have had many aches and pains over the years. Some people take Advil and hurt for months, I go see Dr Katz. No Advils, and the pain goes away in days. Much better! If you need a chiropractor, I highly recommend Mitch. He is the best!" "Dr. Katz has improved my life! I was in chronic pain for so long, I couldn't exercise or play with my kids for very long without having pain. After a few months of once a week visits, I feel cured! He educated me as to what I could do on my own to help keep my back in good condition and he is always available for a visit. I feel great. I am planning on running an 8k race for the first time in 10 years. Thanks Dr.Katz!!" "I am happy to recommend Dr. Katz. I think what I appreciated most about Dr. Katz is his approach to figuring out what is really going on... not just accepting the last diagnosis you had. He listens, does an extensive evaluation, consults with colleagues if necessary, and took the time to determine the source of my problem and come up with a solution. I feel so much better.. Thank you Dr. Katz." "I am 87 years old and woke up with a severe pain in my neck. I saw Dr.Katz on Friday morning and after an examination he did Spinal Decompression. I returned in the afternoon for another treatment, then on Saturday as well. By Sunday my pain was completely gone!" "I developed an excruciating pain in my neck where I could not move my head from side to side. Having had great success with Dr.Katz treating my lower back pain, I decided to call him about this new problem. He suggested that I have Spinal Decompression Therapy. After the first treatment, which was lesss than 15 minutes, I felt 50% better. The next day we did another treatment and I felt just about 100% improvement. After the 3rd treatment, I was pain free with full movement. I don't know what this treatment does, but it surely worked for me!!!!" "I have known Dr Katz for a number of years and recently on a long road trip managed to "crick" my neck - which produced extremely painful neck and upper back spasms. Upon my return from the said road trip Dr. Katz was able to fit me into his busy schedule. Post a very comprehensive exam Dr Katz correctly diagnosed a compression injury in my neck, and his course of action included Spinal Decompression and then manipulation. As a result of only three treatments I am now pain free and able to undertake normal activities. What I particularly like about Dr Katz's approach is his willingness to listen and fully understand the concern before taking any action. He is a consumate professional and I highly recommend his practice to anyone needing chiropractic help." "After waking up with my head tilted more than 15 degrees to the right side, I called Dr.Katz and he did Spinal Decompression Therapy. After the first treatment I had better range of motion and after second treatment I had full range of motion and no pain. I felt so good that we actually cancelled what would have been the third and final treatment. In two days Dr.Katz was able to help me with 100% results! I am thrilled and would recommend this treatment to anyone with any type of neck pain." "I have been going to Chiropractors since early 1980. Dr. Katz took over for my original Dr. when he moved. I have abused my body through years of sports and daily exercising. I am now paying for it in constant pain. I have terrible neck and upper back pain. Dr. Katz told me about the Spinal Decompression Therapy that he offers. I have now had three of five original treatments and the pain is gone. No more pain shooting down my arms. The therapy along with adjustments is my solution. Thank you for your knowledge and for helping me." "I have been a patient of Dr. Katz for over fifteen years. Having played sports my entire life, I have periodically had the need to get specialized treatment to resolve severe back, joint, and muscular pain issues. Recently, I was having severe neck and back pain and I could not turn my head; a serious problem for an avid golfer! As in the past, Dr. Katz took the time to throughly evaluate my situation and the best treatment approach. Dr. Katz used Spinal Decompression Therapy and after one treatment I felt 50% better; and after the second treatment I was able to turn just about all the way! Now, on the third day, I feel great and am playing golf again! Even if you call at the last minute, which I have typically done, Dr.Katz will always find time to fit you into his schedule. I have been recommending friends to Dr. Katz for years and I highly recommend him to you too! “I came to see Dr.Katz with severe neck and right arm pain. I could not sleep and I was having tremendous difficulty concentrating at work. After he examined his findings and the course of treatment, I knew that I was in the right place. I was a bit apprehensive but he was so patient and kind during my treatment that I grew more and more confident that he could help me. I started to feel better within a week and now 3 weeks later, I am pain free!! Thank you Dr.Katz for everything, I am eternally grateful." “I did a stupid thing and lifted a 700lb entertainment center with very little help. Shortly thereafter, I developed a sharp, very severe pain in my neck that radiated into the top of my shoulder. It was so bad that I literally had to pull my hair just to lift my head off the pillow and I could not turn to the left side. Dr.Katz examined me and then he explained that I had herniated my cervical disc. He prescribed tratction and put me on his Spinal Decompression table. The treatment was very comfortable and afterward I was able to turn my head about 50% more and the pain was alot less. After the second treatment, I was able to turn my head all the way and I feel great. I highly recommend Dr.Katz and this treatment to anyone with a neck injury. The results are fantastic!!! "I've been going to see Dr. Katz on and off for the past 15 years. There is no other chiropractor that I would think of going to! The first time I saw Dr. Katz I couldn't move my head-the feeling was as if my shoulders were weighted with a block of cement. Dr. Katz did a thorough examination with xrays and in the first 15 minutes of treatment I was 50% better. From that day on Dr. Katz is the doctor I see for numerous joint and pain problems. Dr. Katz is friendly, easy to talk with, researches every problem and is cautious with all treatments. He truely cares for his patients and I highly recommend him. Dr. Katz is #1 in my book--go see him--he'll make a difference in your life." "Unlike other chiropractors, Dr. Katz diagnosed conditions in my feet which may have prevented the efforts of previous doctors from straightening my back. No one else thought to look there for imbalance. As a student who has had chiropractic care for the past several years, I also appreciate less soreness in my neck as I sit in class. There's a good chance the care at this office will allow me to "get back on my feet again." "I have been a patient of Dr. Katz for more then 10 years. When I first came to see him I was suffering from neck pain and had been diagnosed with cervical spondylosis and stenosis. I had seen a neurologist and after minimal relief with medication and cervical traction he suggested spinal injections and possible surgery. With chiropractic treatment from Dr. Katz my symptoms subsided and I have been pain free most of the time. Periodic flare-ups are easily managed with prompt treatment. He has also treated me for lower back and shoulder pain. Dr. Katz is a knowledgeable and skillful practitioner. He follows clinical guidelines, referring out for additional diagnostic work (ie. MRI) when indicated. He is an ethical professional with a warm, collaborative approach. I highly recommend him!" "Dr.Katz has really helped me to regain mobility in my neck and after only two or three appointments. I have been to a number of chiropractors over the past several years and his treatments and gentle adjustments really have been effective for me. If you at all appprehensive about going to a chiropractor, I would highly recommended Dr.Katz, he is very careful and sensitive to patient's needs." "I went to Dr.Katz because I had a shoulder injury from swimming.After the first visit my shoulder felt better, and I felt my swimming improved as well! I highly recommend Dr. Katz!" "I have been a patient of Dr.Katz for 17 years. He has treated me for various low back and neck conditions. Recently I had been having pain in my right elbow. It worsened to the point that I had difficulty lifting my coffee cup. Dr.Katz treated me yesterday and again today and I am happy to say that my pain is gone. Weeks of suffering cleard up in 2 days!! Call him if you have any muscle or joint pain. Highly recommended. "Dr. Katz helped me with my tennis elbow where others could not. He was great at explaining exactly what was going on and how we were going to get things back to normal. I highly recommend him." "I saw Dr. Katz for numbness & tingling in my thumb, index, and middle finger of my left hand. This was happening for years. It was becoming worse and really disturbing my sleep,affecting my yoga practice, and practically everything else I did. I finally decided I had to take care of this. I had never been to a chiropractor so I did not know what to expect. He suspected carpal tunnel syndrome. In just two sessions my left hand felt much better and after a few more sessions, I felt like a new person. He really is remarkable, very knowledgeable, very personable, and spends quality time with you. He does not rush you in and out. I am so pleased with my treatment and I highly recommend Dr. Katz." "I developed a sudden,sharp pain in my back. I frantically phoned about a dozen chiropractors, none of whom responded. Although in was 6 PM on a Friday evening, Dr.Katz phoned me back almost immediately. I told him that i would not be able to get in to see him until 7:30 that night, and he said he would wait to see me. Dr.Katz was friendly, informative, and most importantly, he made my back feel much better. He thoughtfully analyzed my breathing, posture and alignment and gave me practical advice to care for my ailment at home. Within a day or two the pain had completely dissipated. Thank you Dr.Katz!" "I am very happy to recommend Dr. Katz. I have gone to Dr. Katz for many years, but recently I came to see him after an injury sustained while on a strenuous mountain hike. I had significant back, hip and upper left leg pain throughout the day and night, most acute when sitting or lying down or trying to dress myself. After 3 sessions of spinal decompression therapy over 4 days, my range of motion was back to normal (50% improved after the first session and within normal limits by the end of the third session) and my daytime back pain was gone. Dr. Katz also taught me spinal stabilization exercises, and the remaining nighttime pain resolved itself within the following week. The last time I injured my back 20 years ago, the recovery took months, but with spinal decompression, my pain was gone in days. Quite remarkable." "Whenever my back acts up, Dr. Katz is my first call. Lately, he has relieved my lower back pain with the use of a spinal decompression therapy. The results have been quite positive and the pain has abated considerably after just a couple of treatments -- from being unable to bend at the waist, to almost total flexibility. Dr. Katz is cool, calm, efficient, reachable and effective." "I had a very bad back and leg pain,so I went to Dr.Katz. After reading my MRI, he told me I had a disc problem. He worked with me on the decompression table and stayed with me during the whole treatment. He was very astute and caring during the many treatments that I had. He was extremely concerned as I am 81 years old. In general, I am a very active person. He took me on time and was extremely curtious. I would recommend him highly to help with body pain. I feel good now, as I am pain free." "I live in California and was visiting family/friends in Chicago en route to a trip to France. Before leaving, I developed low back and left leg pain that continued to worsen. Having had one session of Spinal Decompression Therapy in California, I was looking for a doctor who could do the same. I was referred to Dr.Katz and called him immediately. He got me in the same day and after an examination, he placed me on the decompression table. Well, 3 visits later, I am feeling so much better. I am ready to go on my trip. Thank you Dr.Katz for helping me, getting me in so quickly and for seeing me daily up to and including my departure day. I have told all my friends about you. Highly recommended." "I highly recommend Dr. Katz! I returned to him (after 3 years with no pain) because my lower back was acting up just before a trans-Atlantic flight. I had to get better FAST. He fit me into his busy schedule for several days in a row so I could enjoy my vacation without pain. After the trip, I returned to him to find a more permanent solution. He took the time to totally evaluate my injury and found a solution that not only made me feel better, but prevented future injuries. Dr. Katz is truly caring, knowledgeable, and competent." "Thanks for making this possible." "I was referred to Dr. Katz by two very satisfied patients and I can understand why they were satisfied. At my first session you immediately diagnosed the back issue I was experiencing and began treatment. Your expert hands brought relief, and after several treatments, I am pain-free. I can't thank you enough!" "Dr. Katz is the miracle doctor as far as I am concerned! I have been a patient of his for about 6 years and he treats my back when I need it. He is so good that I actually went a couple of years without having to see him at all because he does his magic and then sends you on your merry way. I love the fact that Dr. Katz does not try to sell you a bunch of stuff and services that you do not need. He is there to treat your pain and happy that you feel better. He is extremely thorough and conservative in his treatment. I also love the fact that he is always learning new treatments and therapies to keep himself updated in his field. I have recommended him to many happy patients. He is passionate about what he does and aside from being a top notch chiropractor, he is is great guy." "Dr. Katz has treated me for a myriad of back problems, mostly sports related, over the years. Not only has he kept me walking, but he's made it possible for me to continue to play golf. The most impressive thing about Dr. Katz is that he listens to his patients and is interested in their daily lives. He uses this information in determine causations and treatments. He was the only one of a number of medical doctors and other chiropractors that I had seen that noticed the signs of a larger problem that turned out to be compression fractures in my spine. He immediatly developed a plan and schedule to fix these problems. Without his attention to detail, I could have been more serverly injured. I have in the past and will continue to recommend Dr. Katz to anyone having back pain." "I first saw Dr. Katz over 10 years ago. He is the only chiropractor I have seen since my first visit to his clinic. He knew what he was doing when I first went to see him, and in my opinion has gotten better and wiser over the years. I trust his diagnosis and the times I have had to return for treatment, snow shoveling, gardening or work-out related problems, he has treated the problem effectively and promptly. I rate his work 5 stars." "I just started seeing Dr. Katz due to a recommendation from a family member. I am currently a high school student, and I had never been to a chiropractor prior to Dr. Katz. Not knowing what to expect Dr. Katz made going something I looked forward to every day,and healed my back in the quickest, most efficient way possible. He got me back on the basketball court way faster than I anticipated. I highly recommend Dr. Katz to anybody, including high school athletes, due to my swift recovery and great experiences with him as a person." "I made an appointment with Dr. Katz because of ongoing lower back pain, he evaluated and recommended x-rays. On the 2nd visit he diagnosed, came up with a solution of custom made orthotics, and made an adjustment. On the 3rd visit the orthotics were fitted and it corrected my posture immensely, while also alleviating my back pain. It has now been approximately 3 months and my back pain has improved dramatically. I now need to only go in for periodic adjustments. Dr. Katz has been a life saver. I recommend Dr. Katz and his overall approach." "I have seen Dr. Katz for 18 years for a variety of ailments. Plus, I've referred many friends and family to him. I know I can always get a detailed, thorough assessment of whatever is bothering me. He will not just adjust you and send you on your way. Most recently, I had been having terrible pain in my hip after walking, sleeping or exercising. And I'm just 49 years old so I didn't think I needed a hip replacement! Dr. Katz saw me over the course of a few weeks, performing adjustments and instructing me on proper stretching to do in between visits, and he suggested I try swimming as a low-impact way to keep my joints moving. I'm pleased to report I no longer have that pain and I can now move with ease. I'm seeing Dr. Katz now for work-related shoulder pain and know that in just a little while, I'll be pain-free!" 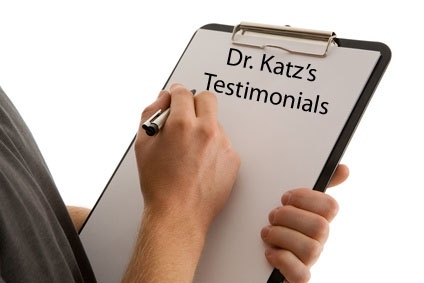 "I recommend Dr. Katz very highly. He has helped ease most of my chronic pain. He's the type of doctor that tries to help you entirely; not just an adjustment, which is typical of most chiropractors. In addition, I have received the best orthotics ever from his service. I have had all types of orthotics over the years, from other chiropractors, pediatrists and orthopedists created by foam and plaster casting. I have major over-pronation and dislocated knee caps. These orthotics have not collapsed on me and I no longer have pain from plantar faciitis, strain on the knees, and much less pain in the lower back (only have to be adjusted occasionally). On top of all this, he's a really nice guy with great energy that one likes to be around." "Dr. Katz has been treating me for twenty plus years. He has allieviated my neck and hip pain. When I mentioned I had been seeing a podiatrist for plantar fascitis to no avail, he also treated my foot with complete success. I have been pain free ever since. He is thorough, always seeking more knowledge and gentle. I am grateful to have him treating me and my family." "Dr.Katz has adjusted my feet and I can honestly say that they have never felt better. I did not really know how tight and stiff my feet actually were until he started working on them. Not only does my feet feel great, but the rest of my body feels better as well. Excellent care, fantastic results." "You have no idea what Dr. Katz has done for me! He literally changed my life! I had horrific migraine headaches since the time I was 10. I'm 54 now and tried everything--naprapaths, accupuncturists, dietians, drug after drug...nothing worked well or long-term. Dr. Katz tried trigger point therapy on me and my major migraine pain has been alleviated--totally amazing. His techniques have also helped me immensely with my severe neck and shoulder pain. He is completely thorough, listens to his patients, asking many questions to determine the proper course of treatment and then spends time explaining procedures before administering them. He is very gentle with his treatments as well--I never feel any pain. Dr. Katz is the best!! A+++"
"I am thrilled with Dr. Katz because he fixed the headaches I was suffering with for almost a year. I was injured 3 times within a year, and had all sorts of other treatments and therapies. Nothing else worked. Not only does Dr. Katz listen to you carefully, he really searches to find a solution to your problem AND he explains everything thoroughly so you understand why he is doing what he does to you. He is top notch. Don't hesitate - Contact him now if you have pain." "I have seen Dr. Katz a few times when I have visited my mom from California. He has previously helped me with neck pain related to my job and gave me exercises to help combat the pain. He even sent my chiropractor in California more information about my diagnosis so she could continue his course of treatment. Recently I was visiting my family for Thanksgiving and had a horrible head ache. My mom suggested seeing Dr. Katz because it might be related to my neck again. After seeing him one time my horrible headache went away. I went back again to have further analysis of my alignment issues and it seems again my job is reeking havoc on my body. Dr. Katz fit me for orthodics which I look forward to receiving soon. All and all whenever I am in town I visit Dr. Katz for whatever ails me and I highly suggest him for your pain management." "I started seeing Dr.Katz back in November for ongoing neck and shoulder pain that were resulting in regular headaches. I have had chiropractic care before, but always felt a bit rushed in and out with a few general adjustments. This has not been the case with Dr. Katz. He evaluated not just the areas of pain but my overall health and well being and came up with treatments that catered to my specific needs. Rather than just treating the one area of pain he started from my feet - which I had never experienced before. After about 5 visits I was pain-free and headache-free!! Dr Katz is a very upfront and honest, I felt very comfortable asking questions and knowing that he was more concerned about my treatment than time/schedule/billing. I also utilized Dr.Katz for dietary and well being concerns. I worked with him on a health evaluation that pinpointed where my vitamin deficiencies were. I am now taking Metagenics daily vitamins and feel such an improvement in my energy and digestion." "I have long suffered from gastrointestinal issues which previous primary care physicians attributed to IBS and essentially indicated that there wasn't much that could be done to treat it. Dr. Katz put me on a nutritional program and already I have seen a significant decrease in the level of discomfort I highly recommend him!"